Diets with high protein and low carbon hydrate contents have become extremely popular recently. Such diets considered peculiarities before have soon become part of our lives. Most of us do not stick to diets like these too strictly, though most protein and less carbon hydrate is consumed. Another problem is that unfortunately a lot of people consume antiacid substances that greatly weaken the digestion of proteins in the intestines. Improperly pre-digested proteins cause unpleasant state of health, e.g. flatulence, gas formation, constipation, besides being unhealthy or harmful, too. Intestinal flora might ferment the protein in the colon converting it into harmful toxins, for instance fatty acids with ramifying chains/bounds, ammonium, phenol or hydrogen-sulphide. These toxins, absorbed into the body, might lead to cause several diseases. Therefore it is wise to digest every protein intake very carefully, so that they could build in the body as own proteins. 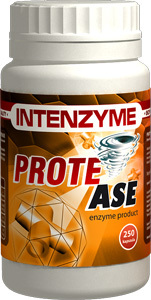 Protease Intenzyme is a mixture of proteolytic enzymes which has been designed to support digestive enzymes. Protease enzymes split proteins and decompose proteins into amino acids. Proper enzyme provision of the body contributes to the maximal absorption of nutriments during digestion. Digestion supported by enzymes digestional energy-need is reduced by saving such energies, too. The energy saved this was can be utilized to satisfy other needs of the body. Its administration is recommended especially in case of protein-rich, but carbon hydrate-poor diets in order to support protein metabolism or in case of decreased proteolysis.